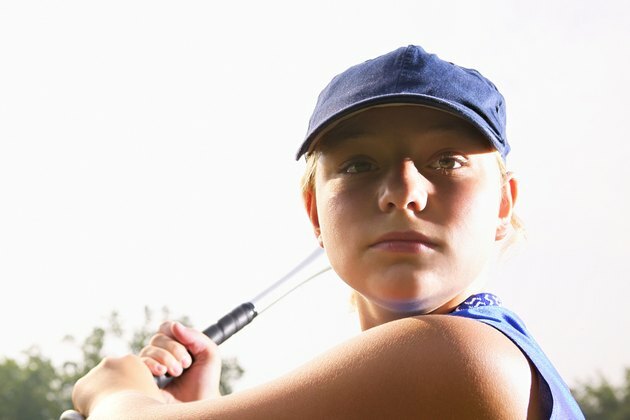 Although each state athletic association can set its own rules, middle school softball is basically played in accordance with high school rules established by the National Federation of State High School Associations, or NFHS. The most typical exceptions to NFHS and state high school rules involve pitching distance and the number of games played. Under NFHS rules, the distance between the tip of home plate closest to the catcher and the leading edge of the pitcher’s rubber is 43 feet for girl’s fastpitch softball. In some states -- Maine, for example -- each middle school conference sets its own pitching distance. As a result, the Southern Maine Middle School Athletic Conference pitches from 40 feet while Maine’s CCC league uses a 43-foot mound. In other states, such as Ohio, the middle school pitching distance is a uniform 40 feet, even though the state’s high schools pitch from 43 feet. The NFHS let each state decide how many games a team can play. Like most sports, middle school teams play fewer games than their high school counterparts. In West Virginia, high school softball teams may hold two preseason scrimmages against other schools, followed by a maximum of 31 games. But West Virginia middle school softball teams are limited to one scrimmage and 18 games. North Carolina middle school softball teams may play 14 regular-season games, plus one tournament of no more than three games. Teams that don’t play in tournaments may compete in 16 regular-season games. State associations or local conferences typically develop a “mercy” rule for middle school softball games in which one team takes a large lead. Florida’s Palm Beach County Middle School Activities Association stops a game if one team takes a 15-run lead after three innings, or a 10-run lead after the losing team has batted five times. Maine’s CCC league uses the “nine-batter” rule, which limits a team leading by 10 or more runs to a maximum of nine batters per inning. A CCC team leading by 12 or more runs after five innings is declared the winner. In most respects, middle school fastpitch softball games resemble high school games. Contests are scheduled for seven innings, although middle school games are more likely to have time limits. As in high school, runners can't leave their bases until the pitch has crossed home plate. Teams may use a designated hitter in place of any player, plus courtesy runners when pitchers or catchers reach base.